This year I have been researching the picturesque aesthetic as applied to displays for my ceramic sculptures. At first, the term picturesque was applied to both a real landscape that was “fit to be made into a picture”, and the painting that depicted that landscape. Dioramas use many elements of the picturesque aesthetic to create a scene. They create a natural artifice, a man made landscape that seems natural, even the animals are posed by the taxidermist to seem to be performing natural behaviors. I also discovered in reading about the picturesque aesthetic, that certain animals are more picturesque than others. The deer for instance, is one of the most picturesque animals because of the delicacy in their legs and antlers, and its connection to the woods. Other animals become picturesque with age. A pristine muscled stallion is smooth and beautiful, while a weathered work horse is seen as rougher, and therefore more picturesque. The intention of dioramas in natural history museums is to educate and entertain, while preserving a snapshot a specific animal and its habitat. 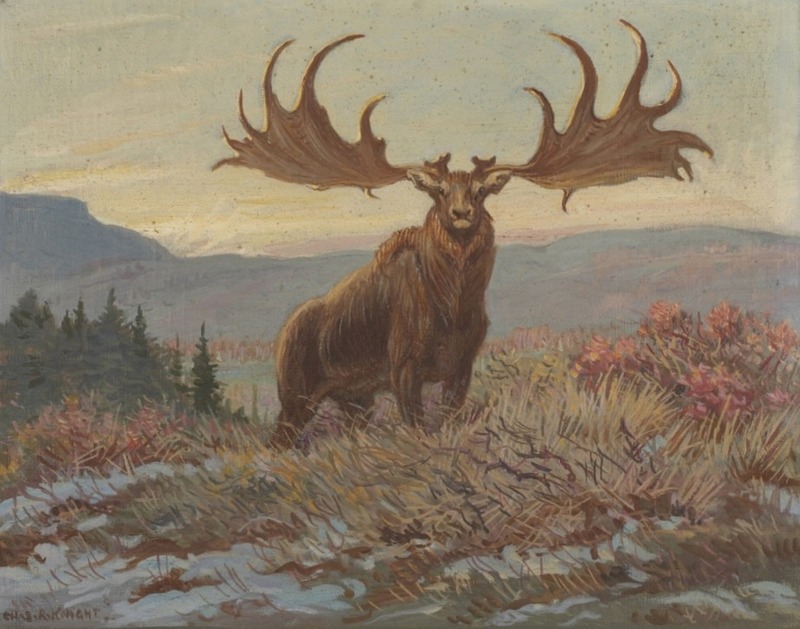 The history of the diorama is a long one, and the earliest dioramas were connected with the first movements in environmentalism, and the creation of the national parks. These distinctions can also be made about the picturesque and the sublime. Zdeněk Burian is one of my favorite paleoartists, he was Czech, and illustrated many books on prehistoric life in the 1940’s. His reconstructions had a major impact on paleontology at the time, they gave visual clues that helped inform scientific theories. The idea of a prehistoric world at first seems more sublime, nature run wild, unchecked, enormous, and overwhelming, even terrifying to a human. But Burian’s work is in the picturesque mode. These are pleasurable windows into the past. The wildness has been softened, idealized, and made to be inviting. The scene frames the action of animals, as though they are actors in a play. The animals are intelligent, realistic, and wonderfully strange. The illusion is convincing, as if you could dream yourself there, and strolling through the ancient past would be like strolling through a meadow. The idea of picturesque travel in the eighteenth century was meant to arouse emotion through nature, and suspend thought. This experience of nature is felt, not analyzed. As the popularity of extravagance and distraction grew, the aristocracy lost control, and fell to revolution. The overgrown classical ruins and fabriques used in the picturesque style idealize the past, but at the same time foreshadow the cyclical nature of history and time, and the inevitable rise and fall of civilization. They represent the idea of nostalgia that was popularized during the eighteenth century. These partially hidden structures are designed to trigger the imagination, and a longing for the past. This in itself is an illusion, because while the past may seem glorious, it often was not. There is an interesting contradiction that happens in picturesque gardens when ruins are fabricated to create a sense of this longing, and purposefully overgrown by nature to seem like remains of grand human achievement. This use of ruins also causes the viewer to question their own existence, and as Diderot states, “reminds us of the instability of human things”. This piece attempts to use furniture to frame a three dimensional picturesque scene. I am interested in the way this removes the animal sculpture from the pedestal, and gives it an environment with more context and meaning. Here, the candles in the chandelier symbolize the passage of time, while the overgrown marble floor provides the same feelings as the picturesque ruins that have been reclaimed by nature. There is an anticipatory narrative in this piece, allowing the viewer to make up the story for themselves. I think that this provides a deeper connection with the animal. The strange features of this prehistoric elephant called a gomphothere also inspire curiosity and fascination in order to spark the imagination. This fantastical rock formation was another way of framing a scene, and separating the animal from the pedestal. 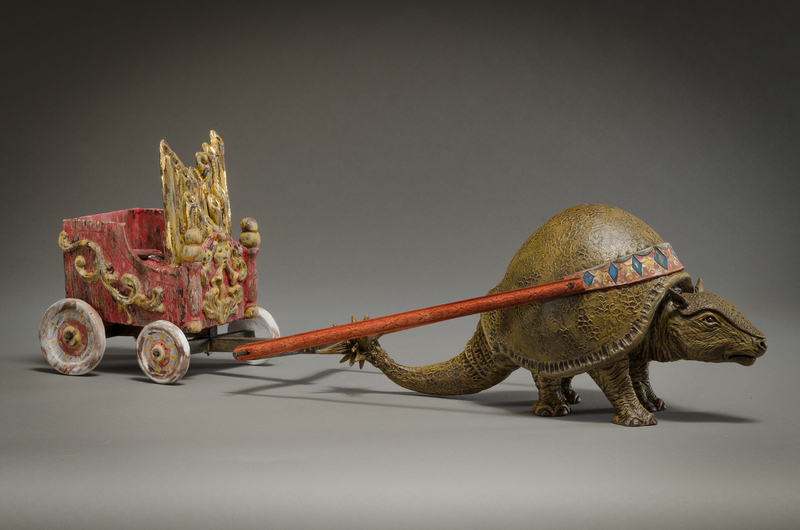 The miniature scale of the carriage gives a grand scale to the animal, while his comical interaction reveals the humor in the paradox of the scene. Making the carriage seem buried in the earth was also a nice visual connection to the way fossils emerge, and the excitement when they are recovered. Thylacosmilus was a prehistoric marsupial predator that lived in South America. I wanted to make an animal that had more of an impact on its environment. I chose this gesture so that the cat could be clawing into a Rococo cushion. 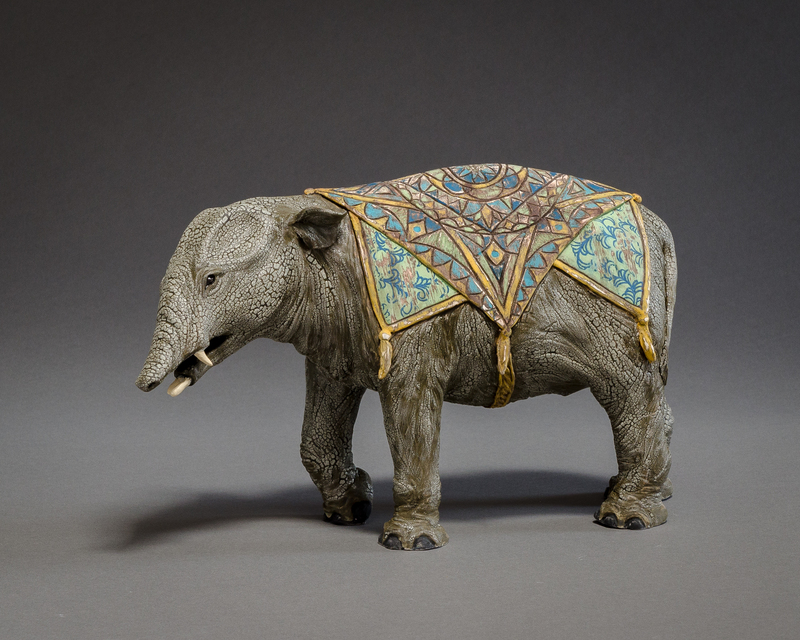 This piece uses the ceramic furniture to display the animal instead of the pedestal. These ceramic table legs are attached to a CNC milled wooden top. The traditional rococo carvings are replaced with natural history motifs. I used ferns instead of acanthus leaves, nautilus shells, horseshoe crabs, and prehistory icons like the dodo. The viewer’s close attention is rewarded with these details. In my second year of graduate school, I researched the use of non ceramic materials as a way to create non-fragile table legs. I learned to make two-piece silicone molds for cast resin. Here, the finished sculpted wet clay table legs are set up with a clay coddle that extends to the halfway point of the form. I use plastic button keys here as a way of making sure the finished mold locks together well. A section of all thread bolt at the top of the leg can be molded as part of the leg for attaching the cast resin to a ceramic table top using a nut. When making silicone molds, undercuts and complex forms do not impede the mold being removed from the cast because the mold material is flexible. Some silicone rubbers are able to even turn inside out to release a cast, and return to original shape. For my molds I used Reynold’s Advanced Materials‘ Rebound 40 silicone. This is a platinum cure silicone, which is more durable and lasts longer than a tin cure. It can be easily measured and mixed by a volume ratio of equal parts A and B. The Rebound 40 product is slightly more rigid than the Rebound 25, again allowing for more durability and strength with less possibility of tearing. The first layer of rubber that is applied is called a print coat, or stipple coat. This is because it is the thinnest, and most liquid state of the rubber, meant to capture all details and reduce the amount of air bubbles on the surface. A cut off chip brush can be a useful tool for stippling the rubber to reduce air bubbles. This coat is often very runny, and flows easily over details, but can become thick in lower places if not carefully controlled. With each successive coat, a thickener called THI-VEX is added to the silicone. Only a few drops is necessary to thicken the rubber so it stays on the high points of the original being molded. Coats can be applied about every 20-30 minutes once the rubber becomes tacky to the touch. Once 3-4 coats are applied, the mother mold can be applied to the first side. For a mother mold material I used Free Form Air. This is a two part kneedable epoxy dough, which when mixed together hardens to a durable rock hard shell that supports the rubber in its original form for casting. Free Form Air is also very lightweight and can even float in water after hardening. The benefit of this is that large molds are not heavy or cumbersome as they would be with a plaster mother mold. This is also a safer, easier material to use than a resin fiberglass mother mold. A release called Sonite Wax is used as a barrier between the silicone and the epoxy mother mold. This prevents the epoxy from sticking to the silicone, or anything else it touches. The epoxy can be pancaked out into thin, even slabs to reduce the weight of the mother mold even further. As the epoxy sets, it can be smoothed with isopropyl alcohol. It can also be surformed, sanded, and drilled after setting. This can allow the use of bolts to tighten the mold halves together, and removal of sharp edges on the mother mold. After 24 hours, the epoxy is set, and the process is able to be repeated on the other side. I used Sonite Wax as a release between the two silicone halves of the mold. Silicone releases from almost any other material easily, except it always sticks to itself. If you forget the release between the silicone halves of the mold it will not come apart. There are two types of silicone bonds to other materials, mechanical and chemical. In a potential mechanical bond, Sonite Wax can seal a porous material to prevent the silicone from locking into it. With a chemical bond, such as silicone to silicone, a release spray may be needed to seal the material, such as Ease Release 200. A second mother mold of epoxy is added to this side once the silicone has set. If too thin, the epoxy will always stick to itself, and can be applied once the first layer has set up. Once the molds were complete, I used rubber bands to bind the two halves, and poured liquid resin into them. The resin I used is called Smooth Cast Onyx and has an opaque black color. Resin always takes on the surface of the original molded material. If the original material is glossy or shiny, the resin cast will be also. Because my table legs were made of wet clay, the resin takes on that wet clay sheen, but is not shiny. Smooth Cast Onyx FAST sets hard in about 15 minutes and has a pot life of about 2.5 minutes. With this material I was able to replicate the table leg forms very quickly. Each leg is cast in two parts (top and bottom), and had to be attached. First, I used a dremel tool and sandpaper to remove the resin seam lines from the side of the legs, and a band saw to cut off the blocks on the ends created by the pouring gates on the molds. I drilled holes in each section and glued metal pins between them. The seam was filled in with Apoxie Sculpt (Black) to match the resin. This sculptable, kneadable epoxy smooths with water, and can be easily carved and textured to match the carvings at the seam line. Here you can see how the legs are designed to accompany a ceramic table top. Holes were drilled in the clay to allow the threaded bolts on the legs to push through and be attached securely to the fired ceramic with a nut. The finished result. The ceramic glaze matched the resin table legs well, but the length, and thinness of the legs caused them to be springy, and not hold up any weight besides the table top. This was a good experiment to see how far I could push these thin, curvilinear legs with another material that is not as fragile as clay. I also experimented with the same materials to make a mold of a cow vertebrae bone. I cast this in resin mixed with Reynold’s Bronze Powder to create a cold cast bronze effect. Real bronze powder is mixed with resin and painted in each half of the mold as a gel coat. The mold can be put together and the gel coat backed with the Onyx resin. The finished cast can be polished to look like cast bronze. I have made it to the La Brea Tar Pits in Los Angeles! I have already had an enjoyable week here making studies of the Columbian Mammoth. These sculptural reconstructions were created for Hancock Park at the La Brea Tar Pits Museum in 1968. Local artist Howard Ball towed the life size mammoths down Wilshire boulevard with his VW Bug. They are a permanent installation in the tar lake a man made lake that dates back to the 1800’s when this area was mined for asphalt. The reconstructions show a family group, the female mammoth is trapped in the tar while the male and young mammoth are helpless to pull her free. The tar creates so much suction that a mere two inches was enough to trap a 15,000 pound mammoth. The first fossils discovered at the tar pits were from that of a saber-toothed cat (by far one of the most common animals found here) by geologist William Denton in 1875. This is one of the more complete Columbian Mammoth skeletons found at La Brea. 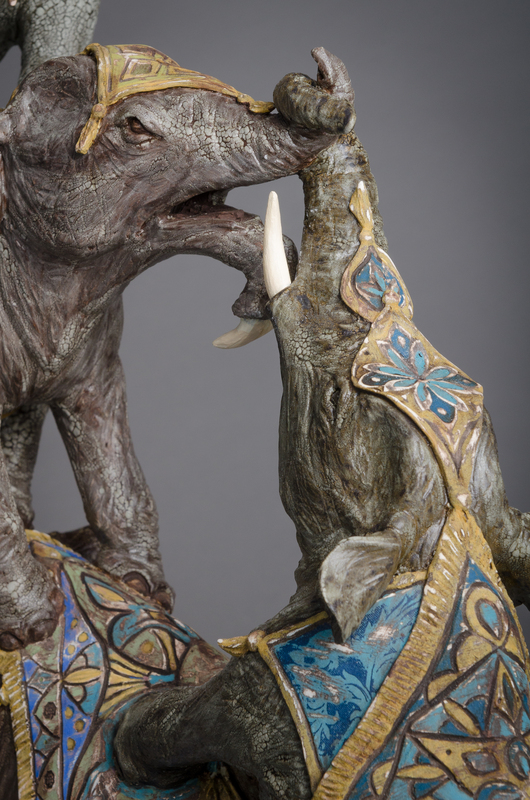 The tusks in this display are cast resin. Most tusks do not survive fossilization because they are made of dentin like teeth, and tend to decay and fall apart until only small sections and pieces can be found. Zed, a recent discovery, is the first mammoth to be found at La Brea with intact tusks, and over 80% of his skeleton has been recovered. Zed is part of Project 23, the current excavation being worked on at La Brea. When digging a parking structure next door, the Los Angeles County Museum of Art discovered Zed among hundreds of other fossils just beneath the surface. In order to save the fossils and avoid impeding construction, the La Brea Tar Pits Museum organized the salvage of 16 fossil deposits into 23 crates. This allows the excavators to take their time preserving and cataloguing each of the hundreds of thousands of fossils that were found. The current crate #14 has been being excavated slowly over the last six years, and originally weighed 83,000 pounds. This is pit 91, one of the regular excavation sites at the tar pits. The current grid contained bones from a giant sloth, dire wolf, and prehistoric horse. The Columbian Mammoth (Mammuthus columbi) lived 20-40,000 years ago in North and South America. The largest Columbian Mammoths were 13 ft. tall, most had an average height of 12 ft. Scientists believe that mammoths lived in female led herds just like today’s elephants. The skeletons of male mammoths are often isolated, suggesting that they lived apart from herds. Most of the mammoths found at the tar pits were males, suggesting that there were no family members to help pull them from an asphalt seep. Studies from my sketchbook of the mammoth currently on display at the La Brea Tar Pits museum. Sketching the articulated skeleton helps me understand where muscles attach to bone, as well as proportions and the locations of joints. It was not possible for me to photograph Zed’s fossil remains personally, since this is ongoing research, but I was able to find images online of what the lab has uncovered so far. This is Zed’s lower jaw. The scientists look at the molars to determine the age of a mammoth. Mammoth molars regrow at even increments throughout their lives. Using this information scientists determined from Zed’s very complete jaw that the was between the ages of 47-51 when he died. Zed’s skull still in the field jacket is at this point too fragile to be removed completely. One of Zed’s tusks, still in the field jacket on display at the museum. This is one of Zed’s tusks that has been prepared so far. It is the most complete mammoth tusk to be found at this site. Mammoth experts have examined this tusk to determine seasonal variations from the time that Zed lived down to the day. Because of the way tusks grow, they provide information about Zed’s nutrition throughout his life. It is likely mammoth bulls used their tusks to fight for mating rights. Zed has several healed injuries that could have come from this type of fighting. Scientists also believe that because Zed showed signs of internal damage that this could have been his cause of death. Zed did not get stuck in an asphalt seep. His bones are only partially pro-mineralized, not entirely bone or fossil, and this is extremely rare. Because of the way he died, not in asphalt, Zed was also found mostly in an anatomical position another rarity at the tar pits. The word diorama literally means “to see through”. In natural history museums they provide a window into a time and place, preserving the animals in their natural habitats. Dioramas both educate and entertain, using visual elements and composition, as well as illusions of perspective. The dioramas at the Los Angeles County Museum of Natural History are beautifully designed windows into ecosystems and animals from around the world. Many of the animals displayed are critically endangered now. The dramatic landscapes and compositions of these displays suspend disbelief placing the viewer up close to places and animals they might not otherwise experience in the wild. I was able to interview Tim Bovard, the museum’s taxidermist who works on many of these exhibits. His office was full of these “death masks”, casts taken from the specimens to preserve features and details in the final taxidermy. Tim has a degree in vertebrate zoology in addition to an art background creating exhibits for museums.His understanding of animal anatomy helps him in his work. Scale models are created for each diorama. Decisions are made about showing family groups, these allow for comparisons between male and female, as well as the young of a particular species. A small study for the background is usually done on location and then used as reference along with photos for the large background mural. Plant life, and other elements of habitat are also gathered and cast or molded for use in the diorama. Each mural is divided into sections separating the foreground from the middle ground and background. The red line here determines what will be three dimensional from the painted background. Tim says that a “drop off” is often used to create an illusion of greater space between these areas. This sometimes means an actual physical drop off between the 3D elements and 2D background. The strategic placement of plant life and rocks can make the transition almost seamless. This sense of space is very important to drawing the viewer into each scene, and creating an immersive environment. Tim also places small animals, or little discoveries as he calls them in each scene. So as you look at the larger animals you are surprised by a bird, or snake hidden nearby. Each diorama is created with a support structure of wire frame over wood underneath. The rocks are usually a combination of plaster and aggregate that gets painted later on. Everything in a diorama is scientifically accurate to the location being portrayed. Real leaves are molded in plaster and then vaccu-formed and cut to create accurate foliage on trees. Real rocks are used as reference for sculptures. There is also a narrative element to this method of display, combining art and science to tell a story. To learn more about he process behind the dioramas at the LA Natural History Museum, watch these videos. The dioramas were extremely helpful for studying a variety of animals. Many of the taxidermy forms have exaggerated muscles, and the interesting gestures the animals are held in are perfect for sketching. I also have also been using the Age of Mammals exhibit at the museum to study prehistoric animal skeletons, and then reconstruct that animal in a sketch. The skeletons were also helpful in studying bone structure and proportions of these animals. 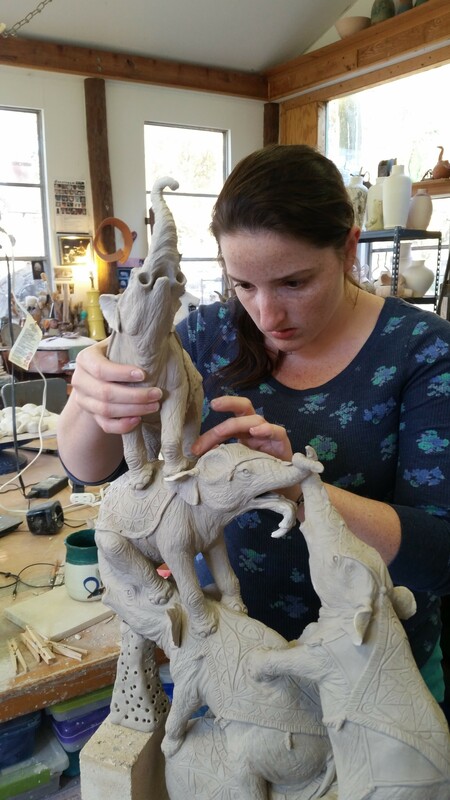 Even some time spent at the San Diego Zoo Safari Park helped me better understand elephant movement and walking gestures for my mammoth sculpture. Now that I am back in the studio, I have started working on a mammoth sculpture based on my research. I always start out with some rough maquettes and small studies for gesture, musculature, and proportions. I’m using the Asian elephant as a reference for anatomy. This is the closest living relative to the Columbian mammoth, and shares the most common physical traits. I have made large print outs of the mammoth skeleton along with images of the Asian elephant, and Asian elephant skeleton for comparison. 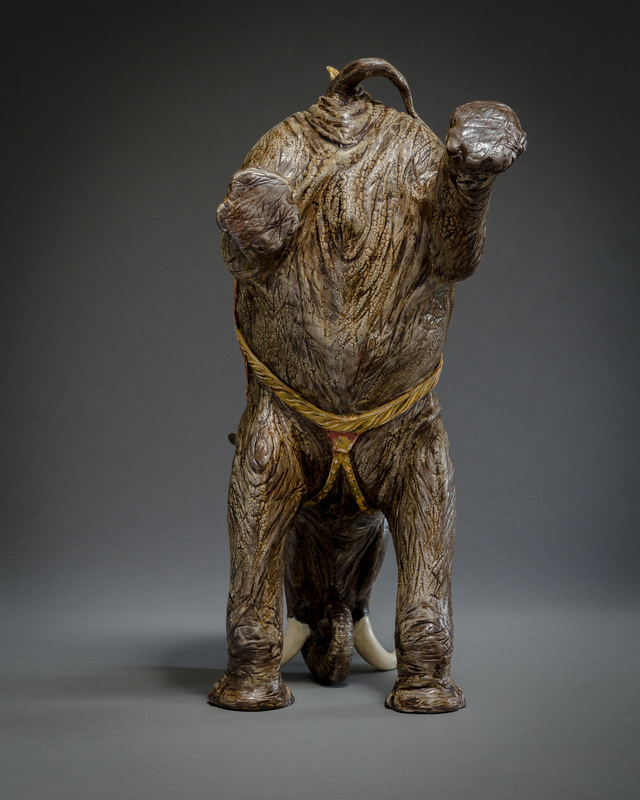 Since the largest Columbian Mammoth was 14 feet tall, my sculpture will be 14 inches tall. Using the large print of the skeleton as a reference I can measure proportion and create an accurate reconstruction. 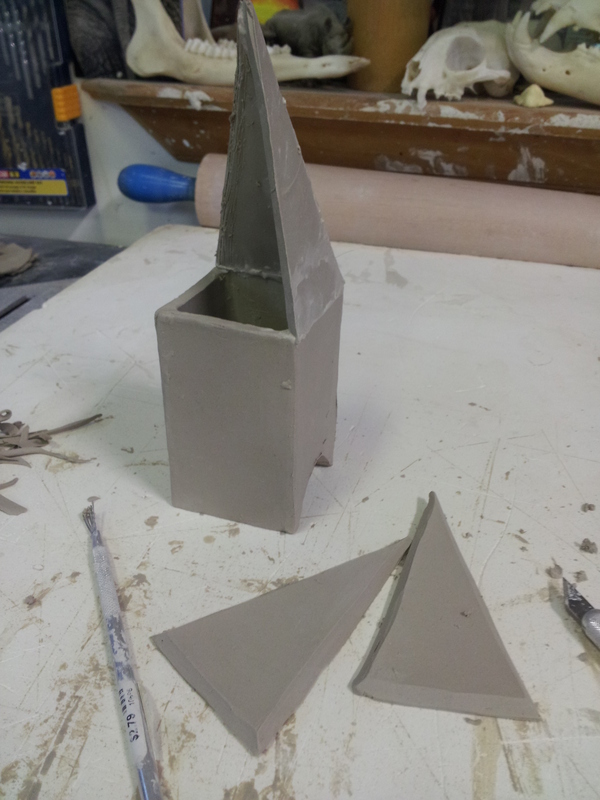 The sculpture is carved from a solid block of clay, and first I rough out the general shape. I carve the block and add clay to areas until the proportions and musculature are correct. Once the anatomy has been defined I let the sculpture dry out for hollowing. The block underneath the legs can be removed as the clay dries and the legs are strong enough to hold the weight of the body. All the detail and texture, and small parts like the ears and tail, will be done after the piece is hollowed. Cutting the mammoth into sections for hollowing. Once the hollow pieces are back together, I am able to sculpt all the details and add small delicate features like the ears and tail. The tusks will be added later, and either be made of porcelain or painted resin. While finishing this piece I have been reading books that focus on popular extinction theory for large mammals like mammoths. I am very interested in the overkill theory that supports the idea that megafauna extinctions were caused by humans. The book Once and Future Giants by Sharon Levy explores this theory and its connections to modern day megafauna extinctions. 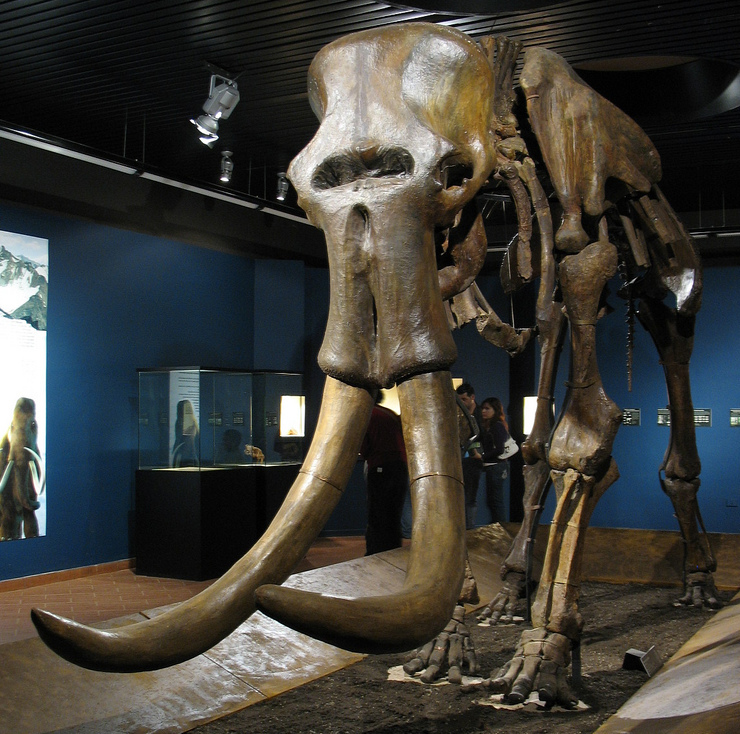 By reading this I have learned that there are a lot of connections between the Pleistocene world that these mammoths lived in, and the climate change and human impact that affects our planet today. This research has also introduced me to scientists that are foremost in the field for they study of mammoths. I am planning to contact and interview these scientists to learn more about important features and evolution of mammoths. For example, I will be contacting an expert in mammoth tusks to find out the most common shape and size of mammoth tusks for my sculpture. Overall, it has been a great summer of research and exploration. Seeing these specimens in person, and studying natural history museum displays will be very important to my upcoming artworks. One of my biggest printmaking influences has always been Albrecht Durer. Durer used the intaglio technique to create engravings like this piece The Knight, Death, and the Devil. Intaglio printmaking involves engraving or etching an image into metal plates, usually copper or zinc. The lines of the image on the plate are then wiped with ink, and damp paper can be rolled through the press over the plate to absorb the ink from the engraved lines. One of Durer’s most famous iconic images is actually a woodcut, however. This very well known image of a rhinoceros became what Europeans believed this strange animal looked like. Durer created this image from a second hand description and a small sketch from another artist that saw what has become known as the Lisbon Rhinoceros. After researching the story of this rhinoceros, it was the animal itself and its journey that interested me even more than the image. The Lisbon Rhinoceros began its journey from the palace of a sultan in India as a political gift to the King of Lisbon. Displayed in the Lisbon palace menagerie, people flocked to see this strange animal. The King then sent the rhinoceros by ship to the Pope in order to gain his favor. On the way, the rhino stopped in Marseilles and was visited by the King of France and amazed crowds of onlookers. Unfortunately, on the next leg of the journey, a storm sank the ship, and the Lisbon Rhinoceros died at sea. Even though this animal died, it was able to live on for the next five hundred years through Durer’s iconic image. In my own work I use reconstructions of extinct strange animals to revive the same sense of discovery and amazement that captivated people when the Lisbon Rhinoceros came to Europe. During my independent study I will be working with my own image of a prehistoric rhinoceros inspired by the story of the Lisbon Rhino and Durer’s stylized image. Here is the sketch for the piece I will be creating in the first half of summer. The background will be created by two large scale intaglio prints pulled from 36”x 24” plates. The rhino and the rock in the center will be a clay sculpture. The surface of the piece will have slip inlay and carving in order to merge the sculpture with the prints. I will be using smaller plates to bring cut out images into the foreground. Etching is a long process that begins with a bare plate of copper, or in my case zinc. These soft metals are able to be scratched into, and scratched lines can be etched deeper with nitric acid. This is one of my 36”x 24” zinc plates. The first step is to scour the coating off the metal using comet and scotch brite pads. This polishes and smooths the surface and removes grease from the surface of the plate. Next, the plate is coated in “hard ground”. This is a mixture of asphaltum (tar) and mineral spirits. This mixture is able to resist the acid bath, so that only the lines scratched through the hard ground will etch. My sculpture has started this week as well. Using a steel pipe armature to hold up the weight, the sculpture is built solid, and later hollowed out. The roughed out form of the rhino on the rock is now ready for hollowing and then details. I will be carving into the surface of this piece to do slip inlay later on. In order for the image I create on the plates to be enlarged, I had to rework the original drawing several times, using a large format print, and then tracing paper, and finally a transfer of the drawing to the plates themselves. This is the large format print, a scanned, enlarged and reversed version of the original sketch. In order to print the right way from the plate, the image has to be reversed from the original. Tracing paper is put over these prints so that the drawing can be reworked for more detail at the new larger scale. Things like the ship changed a lot from the original small drawing. Next, the drawing had to be transferred to the plate itself. I used newsprint coated with iron oxide that contrasts well with the dark color of the hard ground coating. The tracing paper drawings were gone over in pen with this iron oxide sheet underneath the iron oxide lines are transferred to the plate so they can be etched. Here the lines transferred from the drawing have been traced with etching tools to cut through the hard ground coating. The plate that is now exposed in these lines is vulnerable to the acid bath and will etch deeper with each exposure in order to hold ink. The finished prehistoric rhinoceros has now been smoothed and is ready for carving. For this piece I will be using a method of slip inlay called mishima. There are many different techniques that can be used to create this effect. I prefer using wax and carving through it so the black slip only goes into the lines I carve. This technique allows me to create cleaner, finer lines. First, I cover the piece in white slip. This will help the piece blend in with the black and white of the prints I am creating. Next came the wax, some preliminary drawing on the surface, and then carving and slip inlay. Before etching the large plates, a test plate was used to determine the amount of time needed in the acid to produce different line quality. This test plate was submerged for specific amounts of time, and then masked in areas to prevent further etching. By using the line quality from different parts of the large plates in each section, I was able to see which lines I preferred at which time increments. Using this time scale, I was able to know when to etch lines deeper, or mask them off on the larger plates. The etching process begins by dipping the plates in an acid bath. The bath is one part nitric acid and twelve parts water. This is a slightly weaker ratio to allow fine lines to be etched slowly. A brush is used to remove bubbles from the surface of the plate as it etches to prevent uneven etching. As the plate is etched certain lines are masked with hard ground to prevent them from becoming deeper. Spray paint is used in the wide lines to create aquatint. The acid works around the small dots of spray paint creating a darker area that is rougher and holds more ink. Lines can also be added in between acid baths, creating even more variation in the depth and thickness of line quality. I added most of the sky lines and shading in the clouds after the foreground had etched and had aquatint. The lines in the clouds were built up in between acid baths multiple times to create value using only line. After the etching is complete, the plates will be ready for cleaning and the “proof” prints which will determine whether more work needs to be done to them. In the first stage of printing the plates have to be cleaned. The hard ground is removed using mineral spirits and lacquer thinner. All the lines must be clean in order to hold ink. Once the plate is cleaned, the proof prints can be pulled. Proofs allow the artist to judge if editing needs to be done. Certain lines can be improved, buffed out, or the whole plate can be coated again for etching and reworked. This is an example of a print station. The plate first has to be coated with ink using passes of each direction to evenly coat the surface. Several passes of wiping with tarlatan (a softened starch fabric) remove ink a little at a time. Newsprint is used to wipe the last of the ink off the surface and clean all the high points leaving ink only in the lines of the plate. The printing press must be set with the correct pressure in order to press the paper into the lines of the plate. The paper has to be soaked in water overnight to soften it enough to be pressed into the plate. Here are the proof prints. Using these I was able to decide on marks I wanted to try and erase in the final prints, and areas that required more attention during ink wiping. After assessing the quality of the proof prints, final prints are pulled. The plate must be completely coated with ink using a squeegee or stiff piece of cardboard. No modifiers were added to the ink in order to preserve the inks stiff nature when the print is pulled. This makes the wiping process take much longer, but the end result is ink lines that stand up and have texture on the paper. First, tarlatan cloth is used to wipe off the majority of the ink. It is soft enough to keep the ink in the lines but remove it from the smooth surfaces of the plate. Newsprint is used to hand wipe the last of the ink from the plate until the high points are smooth and clean of all ink. The large sheets of paper we used for the project had to be soaked over night to make them soft enough to press into the lines of the plate. The paper is then dried with clean towels and laid on top of the inked plate on the press. The printing press bed is tightened until it can apply the necessary pressure to force paper into the lines on the plate. Prints are pulled off the plate diagonally so as not to make gaps in the ink from the straight lines of the plate. The final large prints were seamed and mounted to a sheet of thin plexi glass. This corner shelf has a routed groove that supports the plexi at a slight curve around the piece. The final display merges the sculpture with the printed background to create an illusion of space and provide a scene for the narrative to take place. This piece was inspired by the prehistoric giant deer called Megaloceros that lived during the ice age. Also known as the Irish Elk, this deer was around 8 feet tall, and had an impressive 12 foot antler span. It was actually an ancestor of the modern fallow deer which has similar palmate antlers, but is much smaller in body size. My goal for this piece was to introduce more fantasy into my work. I was researching stories and myths associated with deer that I remembered from my childhood, and came across the myth of the White Hart. Hart is the archaic word for a mature stag. 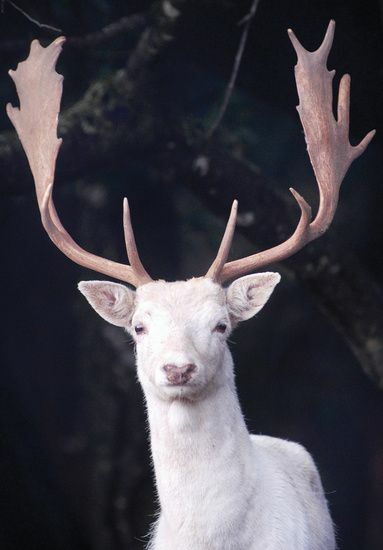 The myth is connected with many different cultures; Celts, English, German, and even Native Americans have stories connected to a magical white deer. However, these deer actually do exist, and not as albinos. They have dark eyes, and the normal coloring on their noses. Scientifically, these deer have developed a rare genetic pattern called Leucism that reduces the natural red/brown pigment in their hair to white. This same condition is found in the rare white lion as well. A white fallow deer, today’s White Hart. In many of these cultures they were believed to have a magical ability to evade capture, and represented mankind’s spiritual quest. In Celtic mythology the white hart was a messenger from the spirit world. 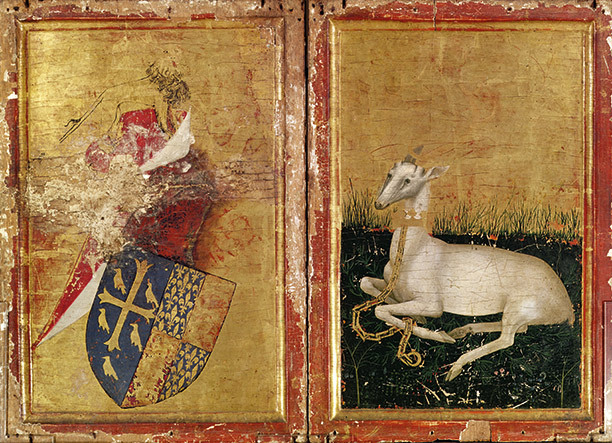 Mostly recognized for its connection to English mythology, the White Hart was a symbol of the king, and protected for royal hunts. The magic of the stag is that it is not to be killed, but will lead the hunter in the joy of the chase to new adventures in order to capture happiness. In modern times the white stag is a vestige of the pure beauty of nature. 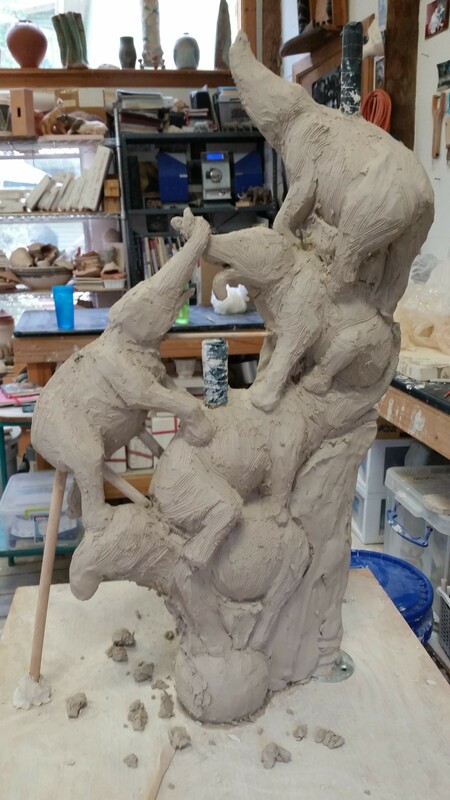 In the rough wet work stage of the sculpture I focus on proportion, gesture, and musculature. I leave off small details like fur texture, ears, and anything thin like the antlers would be. These legs are fairly thin, so I am able to cut them off and leave them solid, but the rest of the body has to be hollowed out and reassembled. I start with the head, and cut small sections using registration marks to help put things back together. The clay has to be very stiff to hold its shape during this part of the process, so I let the thickest parts dry out longer and cover the smaller areas. All the clay inside is first gauged out with loop tools, and then I smooth and compress the walls of the piece with a butter knife. Once the whole piece is hollow, the sections can be reassembled using clay slip to attach them. Keeping most of the piece covered, I was able to sculpt the antlers in place from slabs. I always use the real thing as a reference for texture when I can. The bricks and clay lumps helped hold up the antlers while I cut in the prongs and shaped them. Once the clay was stiff and leather hard, I cut the antlers back off the head and fired them separately, leaving a hole for the peg of the antler to go back into later. The furniture parts were made from hand carved originals that were cast in plaster and press molded to have identical multiples. The cushion was built with a large slab draped over polyfill and manipulated from underneath. 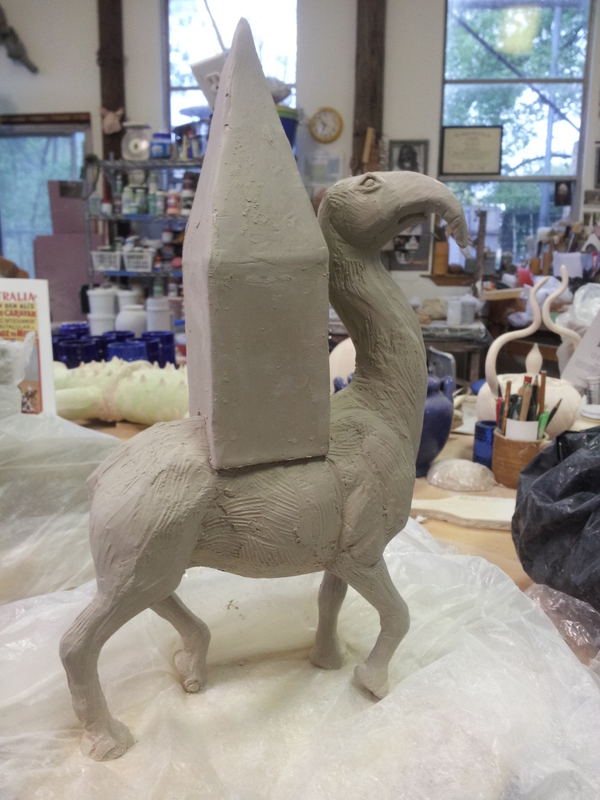 The slab built edge around the cushion was added after I conformed it to body of the bisque ware deer. The weight of the deer on the soft slab supported by polyfill made an impression for the body to rest in without collapsing it. I decided on the surfaces and color palette for glazing through multiple quick watercolors like this one. The finished piece. 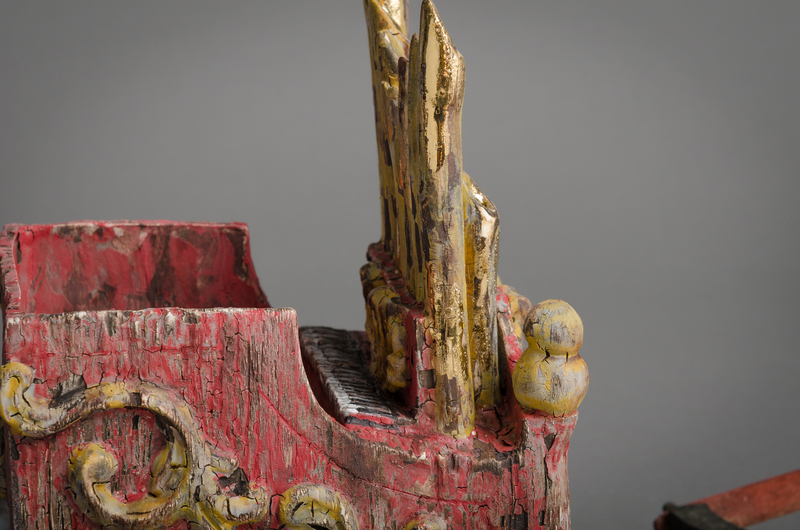 Materials include ceramic, low fire and mid-range glazes, gold leaf, flocking, wax encaustic, scenery building materials, and 3-D printed miniature buildings. The antlers and furniture parts were glued in place after the final glaze firing. I use apoxie sculpt and paint to hide these post-fire attachments. 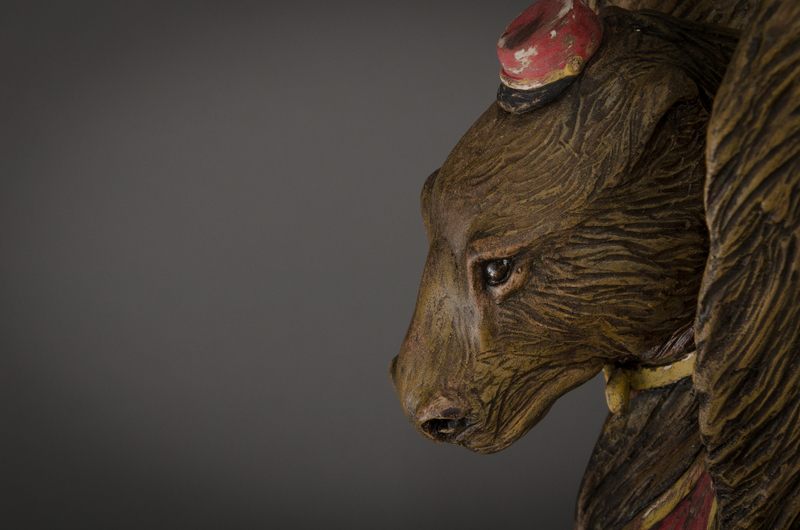 Clear glaze was used on the eyes and nose to make them seem more alive. The glaze used for the fur was Laguna Snowflake (a commercial glaze that I fired to cone 5 with a slow cooling program to produce micro-crystals). Here is a detail of the 3-D printed buildings in the antlers. These were made using open source files on Thingiverse. I used the library 3-D printing facilities at UF to print them to this miniature scale. Next I applied the same grass flock and moss effects used in the scenery and paint to make them look older. The trees and grass are generally used for train set builders to create scenery. The materials were easy to use and manipulate. I found that they create a surprisingly realistic effect for miniature scenery. This poem was inspiring to me as well. I am interested in theories of mass extinction, and the objects and structures that would remain as fossil evidence of our civilizations. The ruins in the deer’s antlers are icons of civilization, and its remains: the temple, the dome, the fountain, and the obelisk. The piece of furniture I made for this piece is an homage to the craftsmen of the past, and the beautiful objects that remain. Part of the importance of using clay to make the furniture was to emphasize the value of virtuosity and skill craft. This piece was a real turning point for me in graduate school so far. The White Hart contains the fantasy, mythos, and narrative that I am striving for in my new work. I enjoyed implementing the influences from working with my dad restoring antique French furniture, and my love for the Rococo style. This piece also embodies the ideas of Romanticism in the emphasis on the passage of time, and the strength and beauty of nature. I am now most of the way through my first year of graduate school at the University of Florida. This is my new studio space. It has been great to have a communal space with my fellow grads and share ideas with them. I always put up a ton of images when I move studios. Most of them are constant inspirations that always move with me. I find that having them in my peripheral vision while I work keeps them in the back of my mind and influences my ideas. Here are some of the experiments I have been working on in the studio. I started out my first semester with a pile of tests, studies, and maquettes. Most of these become surface tests for larger pieces. Working out some new ideas on the small scale. None of these wood pieces were fired, but I used them to get a 3d visual of what was in my sketches. 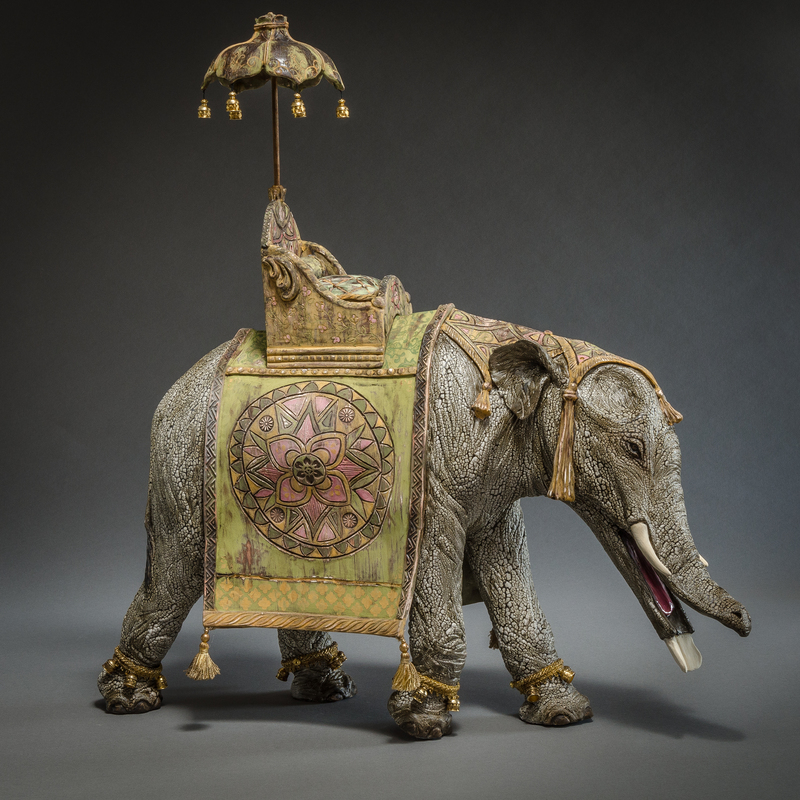 I was researching the howdah (seats on elephant back) and I was interested in the way it creates a place for humans on the back of an elephant. 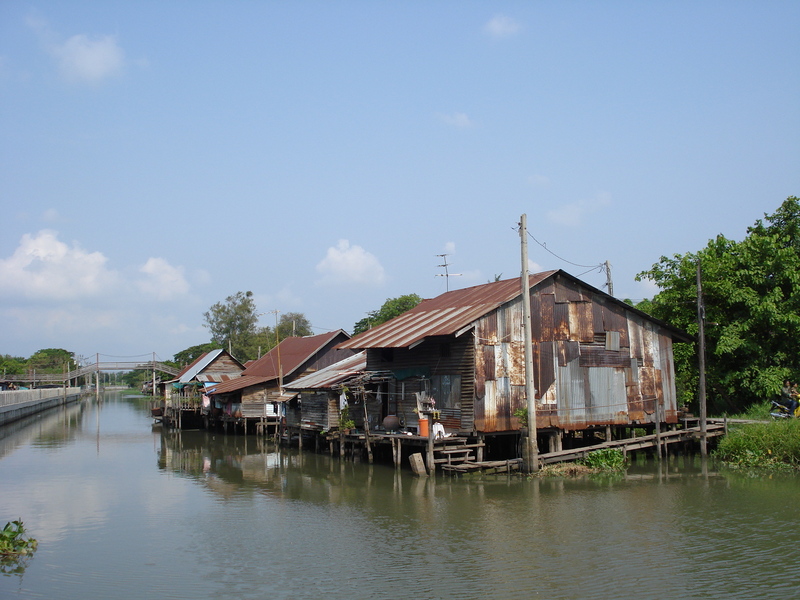 Inspired by this, I looked at other human structures such as the river houses in Thailand and Cambodia where the elephants support much of the economy through labor and tourism. I spent a lot of time in my first semester studying different gestures for elephants and applying them to prehistoric elephants like this Steppe Mammoth. This ancestor of the wooly mammoth was much larger, and lived about 600,000-300,000 years ago in Europe and Asia. Many elephants today crouch on their elbows to reach low water levels with their trunk. This cliff was solid built on an armature on the wall so that I could fit the mammoth to it. I fired them as separate pieces so that I could transport the piece more easily. Liking this idea, I wanted to add even more gravity defying materials in order to make this piece really precarious. 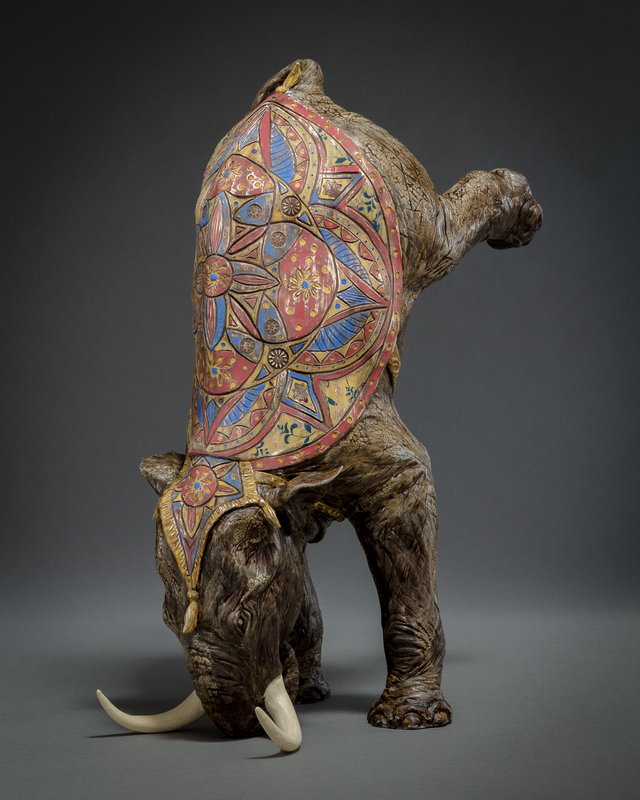 The base of the structure became the ceramic “howdah” on the blanket on the mammoth’s back. I decided to use small pieces of wood to construct the structure on his back, knowing that it would be too fragile to be made of clay. I used the same wood used by architecture students to build their scale models. It was strong, and easy to cut. I used a dremel saw blade to rough up each small piece and make it look older. Thin sheets of wood and cardboard made up the roofs and flooring. I stripped the cardboard of its top layer, and used gray paint on the cardboard to make it look like corrugated metal. Mayco Magic Metallics are paints specifically designed to mimic the natural patina of metal, including rust. I painted these on over the gray to create a realistic rusted look. Gluing these small pieces together allowed me to create a large structure that held together quite well. I broke parts of the structure and re-glued them to make them appear as if they were in the process of breaking and snapping. The finished piece, The Edge of Chaos is named for an extinction theory that describes the way that one small extinction or climate change can be the tipping point toward a mass extinction. Though the mammoth sits on the edge, it is the burden of human civilization on his back that begins to crumble into the abyss. The skeletal architecture of human spaces is weak in comparison to the heavy, powerful pachyderm. This piece speaks to humanity’s precarious place in nature, and our proximity to the edge of chaos. Here are the final pieces in the Prehistoric Circus series that I have worked on for the past two years. 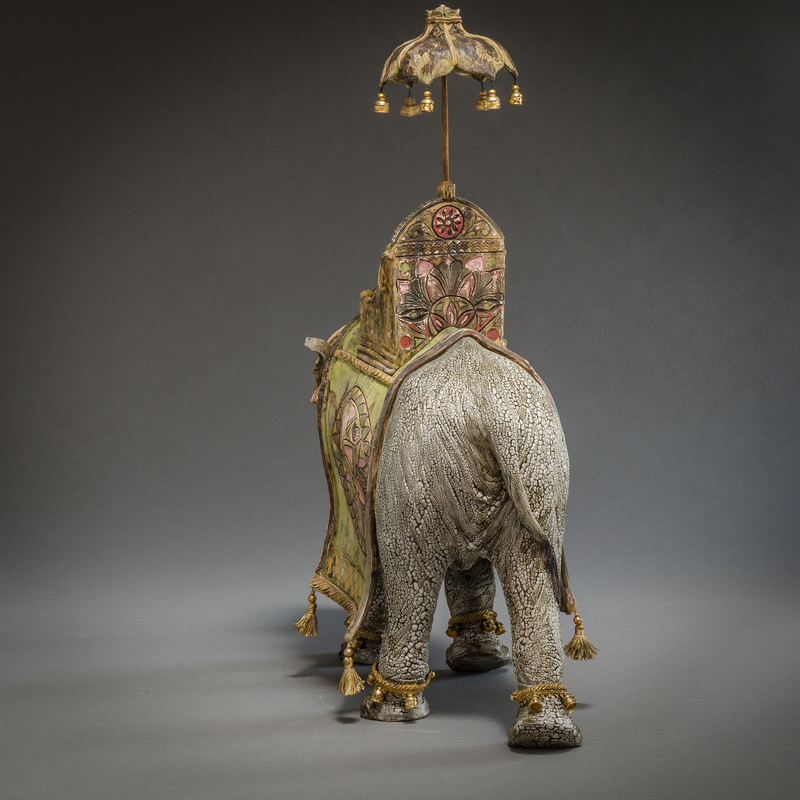 This series focuses on placing prehistoric animals in a circus setting, allowing the viewer to encounter the unknown, the exotic, and the amazing mammals that lived millions of years ago. The nostalgia of the circus provides a connection to the child like joy I find in discovering new animals for the first time. 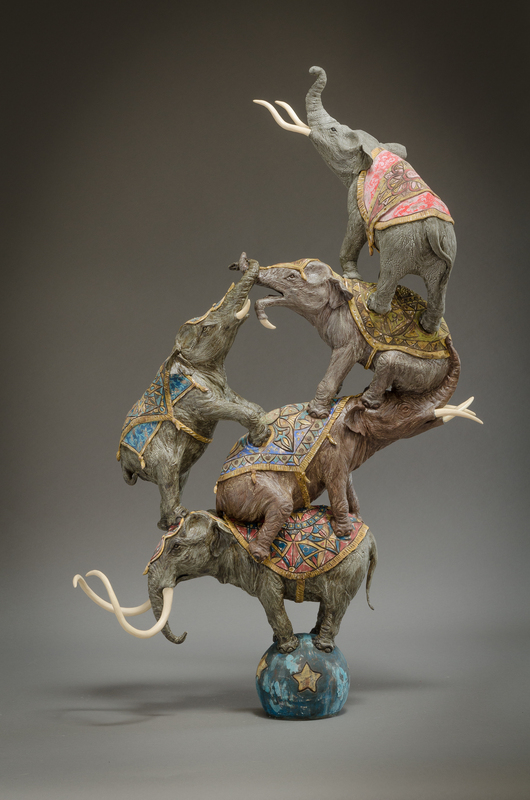 Elements of the circus in each piece create an alternate timeline in which the viewer can travel back and experience the power of these majestic animals. They find themselves on velvet cushions swaying on the back of an ancient giant in an unknown landscape. Colors and intricate patterns are fading; the paint peels and wood rots away under heavy feet and wrinkled hide. As time passes, the animals march on and adapt. Enduring the years like a weathered tapestry, they become the animals we know today. Each piece has a unique pattern. I start each pattern with light sketching like a pencil drawing. Some patterns get filled in with small stamps, or other embellishments. I also leave blank spaces in the pattern to be filled in later with decals, or transfers. 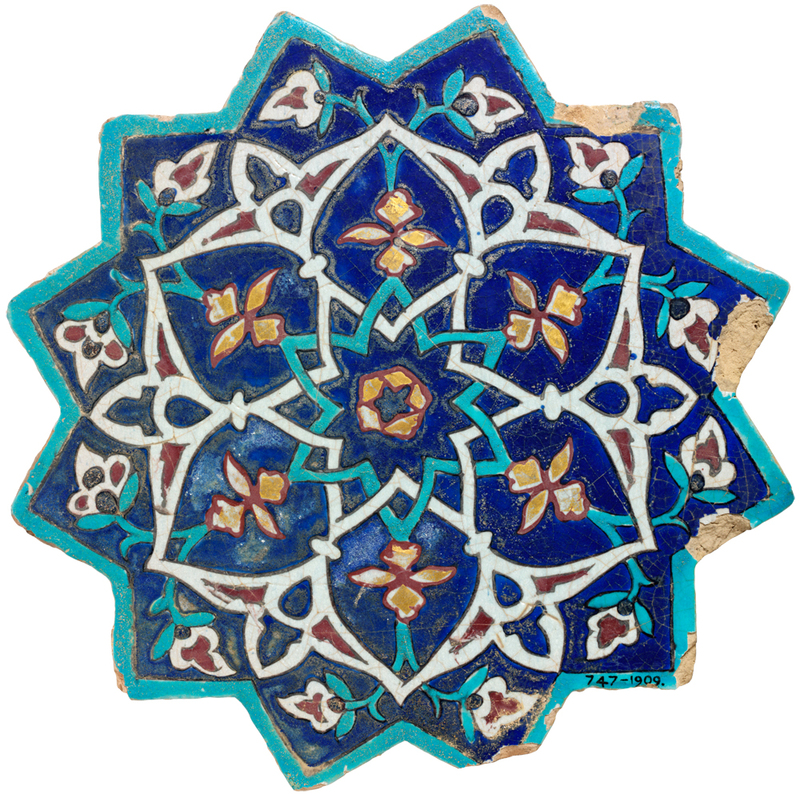 Many of my ideas for patterns are copied, or originate from Hindu patterns, and tiles from Iran like these. A lot of the patterns in the Hindu religion center around a Mandala, literally meaning circle. This circle is meant to draw in the human consciousness. The concentric design is meant to help people meditate and directs the mind to focus inward. 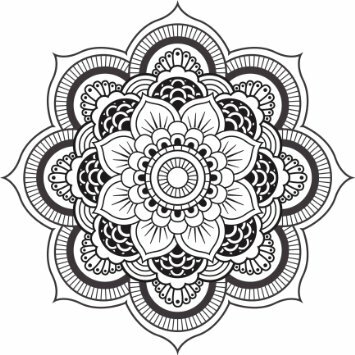 Mandalas are also very balanced patterns that symbolize unity and harmony. I get lost when I carve these complex patterns, and its very meditative. It reminds me of the feeling I get when I lose myself in nature. When I walk in the woods I don’t have to get anywhere, or do anything, and I can be alone with my thoughts. Each of my pieces is made individually, and usually carved from a solid block. I use some small molds for patterns, and embellishment, but no molds are used for the animal forms. 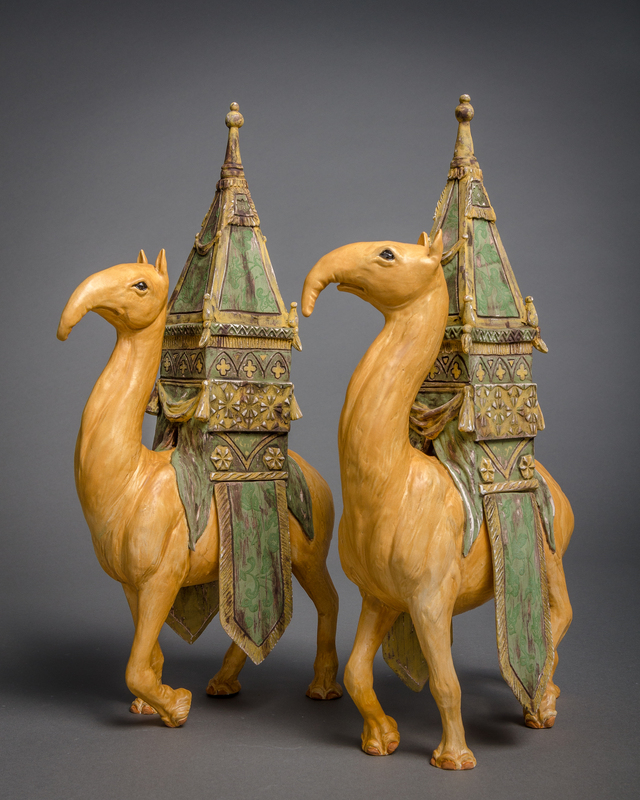 Each animal is carved or built from a solid block of clay, hollowed and reassembled. I often use slab building to help me create some of the parts of my pieces. These tents were constructed and then added to the hollowed animal form. The patterns were carved and added last. A lot of the pieces I made in this series were designed to march in a large parade. This parade was inspired by images of animals migrating in the wild, and the way they seemed to be on parade. I connected this to the free street parade that every circus gave to a new town it had arrived in. 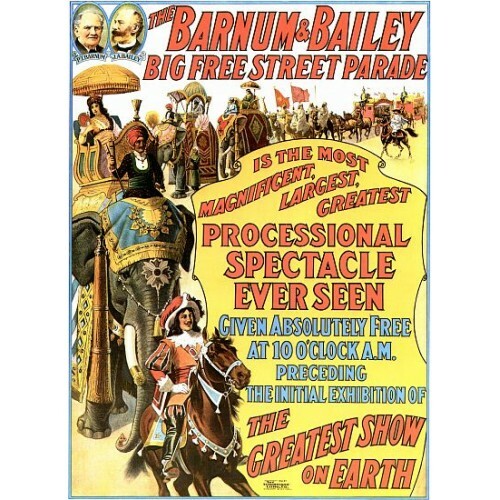 It was a way to display the animals, and various acts, and make people want to come and see the circus. 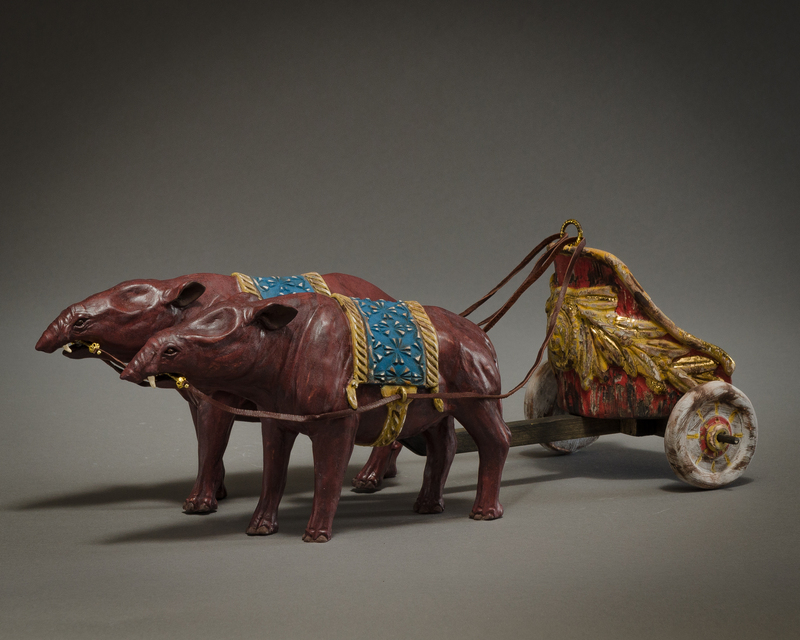 This inspired other pieces involving musical instruments, chariots, along with strange prehistoric animals to pull them. These small pig-like animals are actually the earliest known elephant, Moertherium that lived 37 million years ago. They are also distantly related to the sea cow. They looked a lot like pigs, or the modern day tapir. They were much smaller than their later relatives. Moeritheirum was believed to have spent a lot time in the water eating aquatic vegetation. Size: 2.5 ft. tall, weighing 500 lbs. Much of the distressed surfaces in these pieces was inspired by my dad. 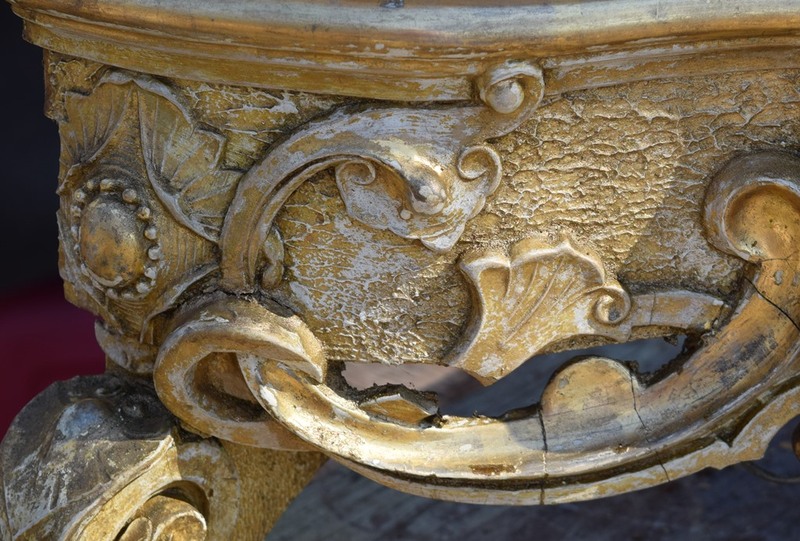 He restores antique furniture, and I grew up watching chipped and cracking gold leaf enter his shop, and the beautiful, glittering, gilded surfaces that would leave it. I loved the way that these objects had stood the test of time, with so much original bright gold still shining through layers of dirt and grime. Their history was revealed in their destruction, but also their ability to survive. The aesthetic in my work is meant to show the beauty in objects that are weathered and worn. 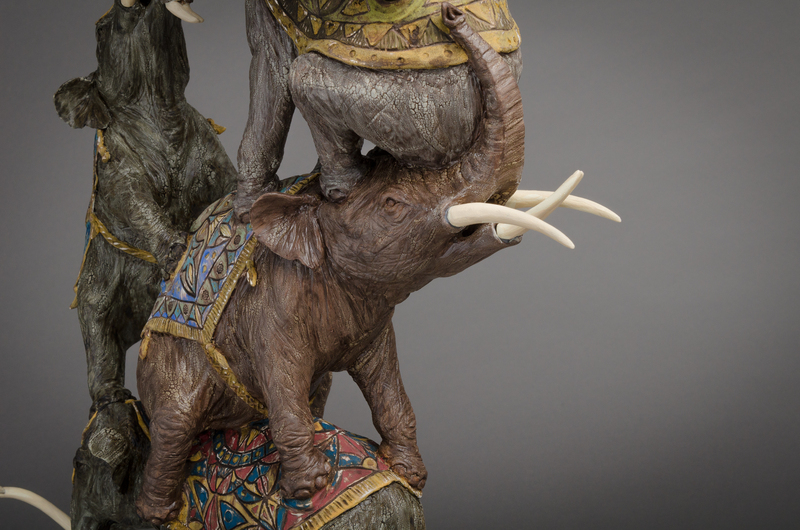 The newest parade elephant is based on one of the strangest prehistoric elephant that I have researched. Platybelodon lived 15 million years ago. 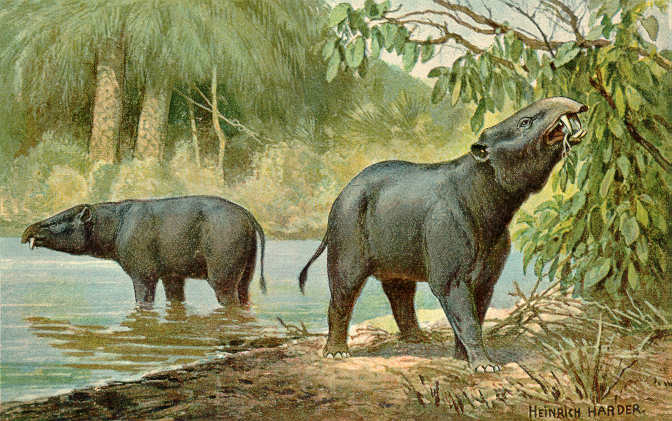 Platybelodon was in a special genus of elephants called gompotheres. This means that they had two sets of tusks, the top tusks being pointed, and the lower ones being flat like shovels. These shovel like tusks were believed to help them scoop up aquatic vegetation. A Colossal Collapse is another Dumbo-inspired pyramid of prehistoric elephants. I love making these stacks of elephants because they are so precarious. The balance in them echoes the balance in nature, and how each animal is connected to the success of another. I also enjoy placing prehistoric elephants that existed in different times together in one piece. 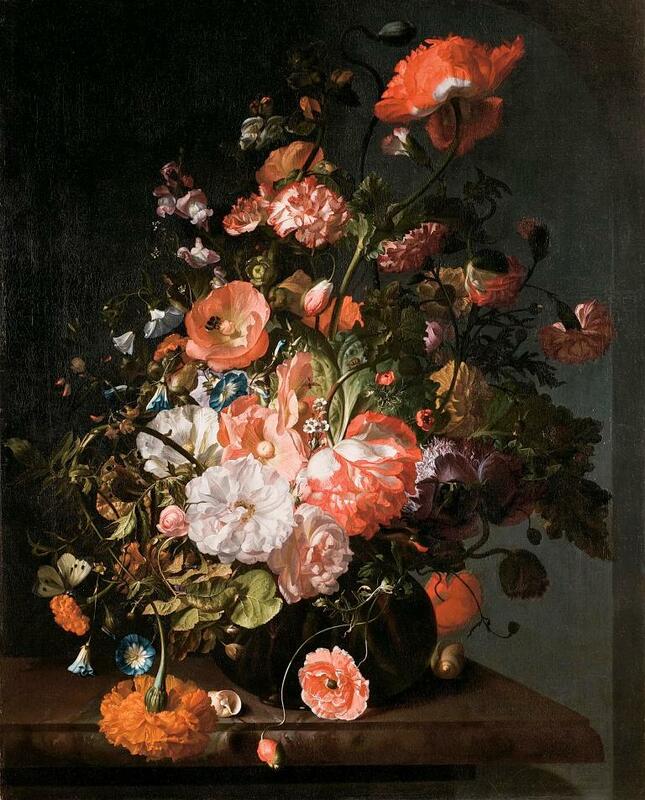 This idea was inspired by the paintings of Dutch still life painter Rachel Ruysch. Her paintings show flowers that bloom at different times of the year in the same bouquet. So this is an impossible composition that could never actually exist, but the fantasy creates something beautiful. I also love how she includes insects, and dying flowers in a lot of her work, to show the passage of time and the way decay in nature leads to new life. 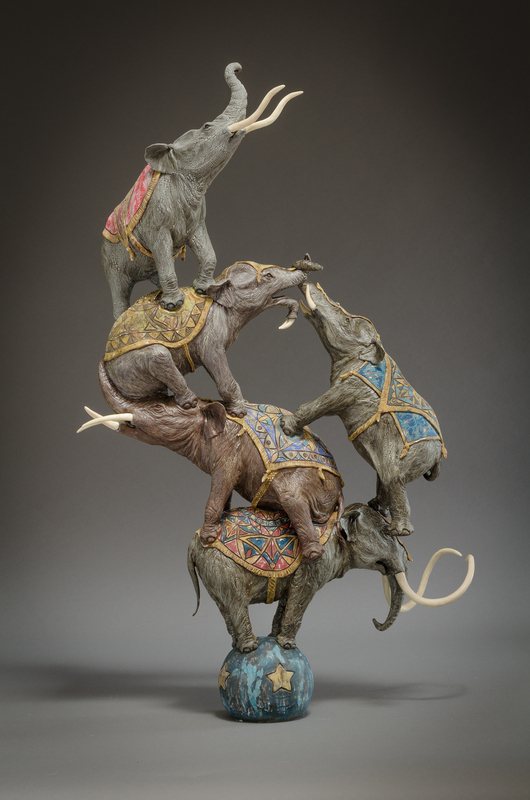 These stacks of elephants start out like all my sculptures, as a solid mass on an armature. The difference here is that each elephant is slowly revealed from the mass and the clay eventually cut away from between the legs. The clay must be allowed to get dry to hold itself up, but not completely dry. This stiffness in ceramics is called leatherhard; the clay is flexible, but also able to be wet down and added to. Once this is achieved and the elephant forms are revealed, I cut each one off the other and pull it off the pipe armature you see here. I hollow each elephant, then reassemble the pyramid. 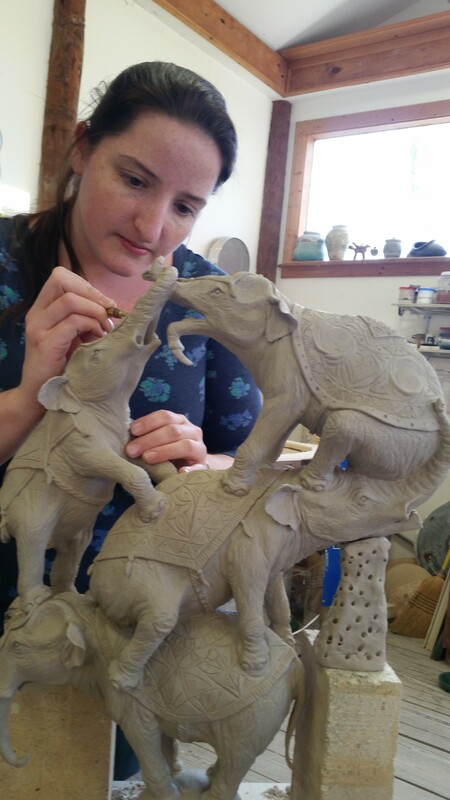 Detail being added to the hollowed, and reattached elephants. Unfortunately, this top piece did not fit in my kiln! So the last elephant had to be fired separately and glued on. This is common in my practice. I am often using mixed media materials, and various epoxies to make my ideas a reality. I think the seemingly impossible balance in these pieces comes from the way I build them as one piece on an armature. the vertical pipes provide a perfect center of balance for the piece. This one did not need anything to help it balance on its own once it was fired. Hans the High Flyer is another giant ground sloth, though probably more acrobatic than the animal that inspired him. Giant ground sloths could be up to 20 ft. tall! 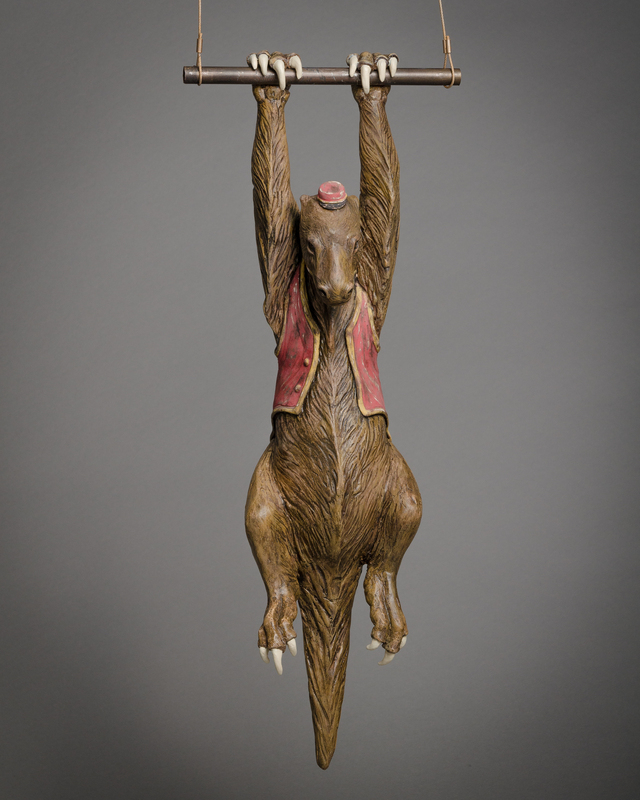 I love the humor in this piece, and when he hangs in a gallery he swings just a little. The Prehistoric Circus will be displayed in a solo exhibition at the Beatrice M. Haggerty Gallery at the University of Dallas in January 2016. You can learn more about this series in a recent article in the 100th issue of Ceramics Art and Perception, pgs. 36-39. Click Here to purchase a copy online. Even though this pivotal series has come to an end, I see many more animals on the horizon. 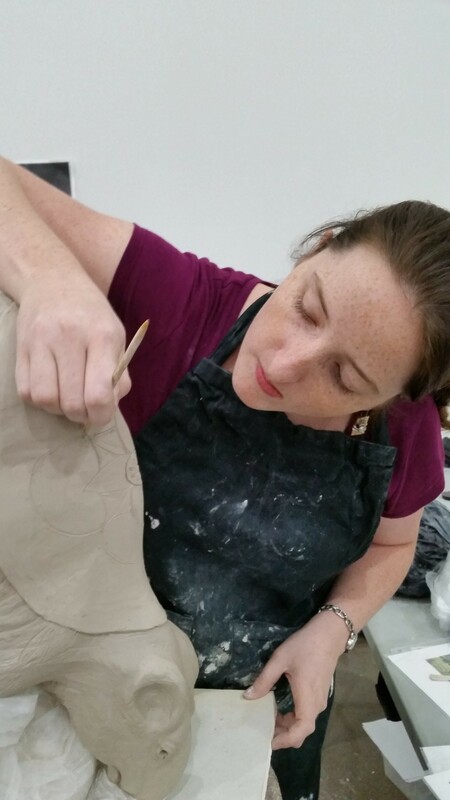 I am currently beginning my graduate study in ceramics at the University of Florida. I have a lot of ideas for new pieces and will be documenting my experiments, research, and process right here. Click the Follow button below to receive updates about new work, and see where the parade will take me!